In an effort to increase communication between chapters that have a geographic commonality and to empower smaller chapters to take the initiative, three months ago, Canadian Magen David Adom hired Sharon Fraiman as Western Region Coordinator. Based in Calgary, Sharon brought Leonard Shapiro on board as the new chair of the Calgary Chapter. 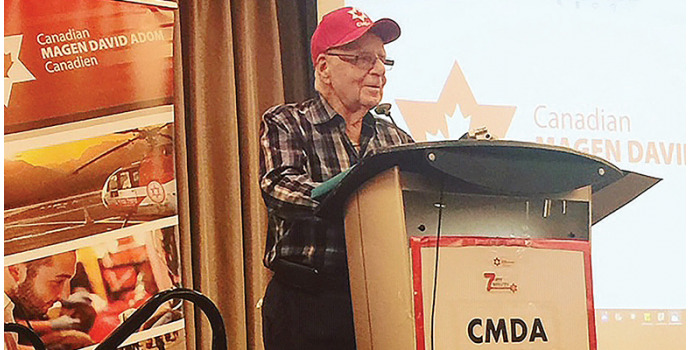 Since then, Sharon and Leonard have been hard at work reaching out to the Calgary community in order to better inform them of the important and life-saving work being done by CMDA on behalf of Magen David Adom Israel. The most recent event attracted 300 people to “First 7 Minutes”, presented by MDA paramedic and Canada Desk representative, Raphael Herbst, and CMDA National Media and Volunteer Coordinator, Daniel Amzallag. Time is one of the most important factors in an emergency situation, and these first seven minutes can feel like an eternity unless those present at the scene of an incident know what steps to take. In addition to members of the community, also in attendance were representatives from Calgary’s City Hall, nurses and EMS teams from Alberta Health Services, participants in both CMDA’s International Physicians’ Unit and in the CMDA Israel summer student program. Other events that have taken place include a Volunteer Awareness Evening with more than 50 people in attendance, including speakers Fanny Wedro, a generous CMDA donor. They explained the importance of supporting Magen David Adom through donations of essential medical equipment and supplies, which will enable MDA to continue to save lives. There was also an event at Chabad Lubavitch of Alberta centered on Magen David Adom’s guide to first aid, “7 First Minutes”. Sharon Fraiman and Leonard Shapiro are grateful to the community for the support they have shown, and are busy planning more events, which will inform people of the life-saving efforts of MDA in Israel. All of our ambulances are manufactured by Demers Ambulances in Beloeil, Quebec, Canada.